Three decades of delving into the mysteries of cystic fibrosis (CF) began with simple, fundamental curiosity. “I just wanted to understand how the airway worked,” says University of Iowa pulmonologist Michael Welsh, MD. In particular, he wanted to know how salt ions move across airways—a biological process that helps lungs defend against infection or damage from inhaled pathogens and particles. Knowing that CF increases susceptibility to lung infection, Welsh suspected that abnormal ion transport could play a role in CF disease. Working with colleagues from the University of California, San Francisco, in the mid-1980s, Welsh first demonstrated that CF disrupts chloride ion transport across airway epithelium. This significant finding preceded the discovery of the cystic fibrosis transmembrane conductance regulator (CFTR) gene by four years. Once the gene was revealed, Welsh and his colleagues set off to decipher the molecular pathogenesis of the disease. First, they showed that the function of the CFTR protein was to act as a portal for chloride ions, and later they discovered that the protein was also required for movement of bicarbonate ions. Over the decades since, hundreds of scientists at the UI—from undergraduates to established researchers and physician-scientists—have contributed to efforts to slow the progression of CF. Their work has helped increase the lifespan of patients from very early childhood to middle age, with the prospect of even greater gains coming from newly approved drugs that target CF defects directly. 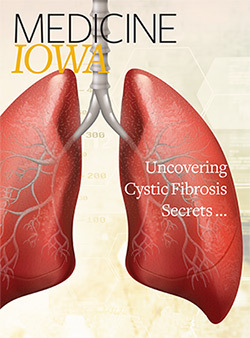 “The work done by Mike Welsh and his team at the University of Iowa has advanced the understanding of CF among physician-scientists around the globe—myself included—and provided so many patients with CF hope for a better future for the next generation,” says Francis Collins, MD, PhD, director of the National Institutes of Health (NIH). 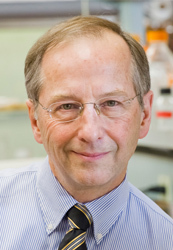 In 1989, Collins, then at the University of Michigan, led one of the three groups that identified the CF gene. 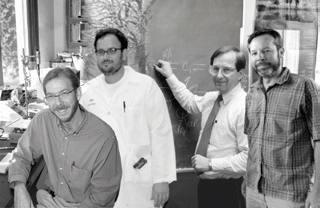 Funds from the NIH and the Cystic Fibrosis Foundation Research Development Program established the UI Cystic Fibrosis Research Center in 1988. And since 1993, UI scientists working on CF have received more than $80 million in continuous funding from the National Heart, Lung, and Blood Institute and the National Institute of Diabetes and Digestive and Kidney Diseases, both part of the NIH. Three decades into the journey, Welsh’s fundamental curiosity remains strong, and his passion for understanding and overcoming CF disease grows exponentially. “This is really an exciting time in cystic fibrosis. Research on CFTR—understanding what it does and understanding why it doesn’t work when it’s mutated—has led to the development of at least three drugs that are approved by the FDA that are effective for people with CF. They’re not perfect yet, but they keep getting better. That work is changing the lives of people with CF,” he says. You're reading one of the features included in the Spring 2018 issue of Medicine Iowa. Read more news and features about the people and programs focused on teaching, healing, and research in the UI Roy J. and Lucille A. Carver College of Medicine.